Visit Santa Fe Itinerary for Art & Food Lovers! Santa Fe is one of the top art and foodie destinations in the U.S. With hundreds of world-class galleries, resident artists, studio tours, art markets, excellent chefs, restaurants, boutique wineries, and distilleries, I recommend at least five days for an immersive, flavor-filled experience of the City Different and surrounding areas. This itinerary will help you plan a great visit with some of our recommendations on where to explore and indulge. First things first, you’ll want a map to orient you to the area. Send me an email with your name and mailing address to Maria@santafeselection.com and I will send you the best one for free, if you are in the U.S. The Santa Fe Selection Mini Guide Maps piece offers three easy reference maps with ideas on where to eat, shop, play and more. Or let me know your arrival date and hotel, and I’ll have one waiting for you upon checkin. When Is The Best Time To Visit Santa Fe? This is one of the most frequently asked questions. We have four distinct seasons, and an abundance of fairs, festivals, and annual events. Pick a month, and there is always something fun to do here. To answer that question specifically to your personal preferences, I recommend checking the links listed below that will give you more details for you to plan when would be the best time for your particular visit. My Weather and What To Pack article shows temperature ranges and offers tips on how to best be prepared for each of the four seasons in the high desert climes of Northern New Mexico. Check our Annual Events Category, which shows you top events, art markets, studio tours, fairs and festivals that you can plan for or around. Last but not least, use our Lodging category to find the best accommodation that suits your needs and budget. Among the many options, you’ll also find our top hotel and inn recommendations in the downtown Plaza area offer special promo code discounts for Santa Fe Selection users. You can book directly with the hotel, vacation rental, b+b, etc., using the links and promo codes provided and avoid paying any third party booking fees. This five-day itinerary is a sampling of some of our top recommendations for art and food experiences with a healthy dash of history and culture. You can also check our complete guide at SantaFeSelection.com for more of our recommendations, and make adjustments according to your abilities, preferences and energy level by checking out each complete listing provided with each referral link, and speaking directly with the guides and operators. Most lodging locations have a 3pm check in time. Once you’ve checked in remember to get hydrated. Being in the high desert, you will need to drink a recommended two liters of water per day to stay hydrated. We are at an altitude of 7,000 feet. The air is some of the cleanest in the U.S., but a bit lighter in oxygen than at sea level. So take it easy and avoid drinking alcohol on your first night. It’s best to acclimatize before enjoying the margaritas. Before dinner, take a light stroll around the downtown neighborhood using the Mini Guide Map to show you top points of interest and to stir your curiosity about all the stories and characters that contribute to the uniqueness of this 400+ year-old City Different. Then enjoy a relaxing dinner at one of our favorite restaurants. See our top recommendations in our Restaurants Category. Santa Fe is the oldest capital in the U.S., it is steeped in culture from Native American, Spanish, and Anglo traditions. After breakfast at your hotel or at The Plaza Café or Mangiamo Pronto, meet up with Elaine Ritchel and Santa Fe Art Tours. You’ll take an easy walk along the famous gallery-lined Canyon Road. Meet gallery owners and artists, such as Aleta Pippin of Pippin Contemporary, Barbara Meikle of Meikle Fine Art, Hunter Kirkland Contemporary, and many more. Learn of the diverse art and artistic influences of the multi-cultural heritage of the area, and the world-class Santa Fe art scene. A peak art experience is to be sure you stop at Peyton Wright Gallery, on the corner of East Palace and Paseo de Peralta. Santa Fe is proud to be home to this internationally acclaimed collection of many of America’s leading mid-century painters and sculptors. Peyton Wright is also renowned for its extensive, museum-quality exhibits of Spanish Colonial art, and pre-Columbian textiles, objects and gold. All are thoughtfully displayed in the historic fifteen-room Spiegelberg House. Tour Duration: 2 hours, or more, if customized to suit. Check this link for Elaine’s contact info, schedules, pricing, or call Elaine directly at (505)985-5298, with questions and to book your tour. Be sure to mention Santa Fe Selection when you call. Day 2: Lunch at Noon-ish. You’ll be hungry after your morning tour and a stop at The Teahouse at the top of Canyon Road is the ideal spot for a delicious home-style lunch. For breakfast, lunch and dinner, from hearty stews, soups, salads, pastas, and fresh baked desserts, to their extensive menu of exotic teas, coffee, chocolate drinks, there’s something for every palate, including tasty gluten-free and vegetarian dishes. El Farol is also at the top of Canyon Road, just across the street from The Teahouse, and they offer a delicious lunch menu during the summer season, including excellent casual fare, gluten-free options, and tapas. After being inspired by the pros’ art in the morning, the afternoon is the perfect time to delve into your own artistic streak, I highly recommend taking a private art class with a professional artist in their studio. Get off the beaten track and try your hand at painting and mixed media arts with Lauren Mantecon’s Art Alchemy Studio. Lauren offers lots of fun with her mixed media and painting classes in her spacious, light-filled studio. A group of friends at Mantecon Studio enjoying an afternoon of creativity. 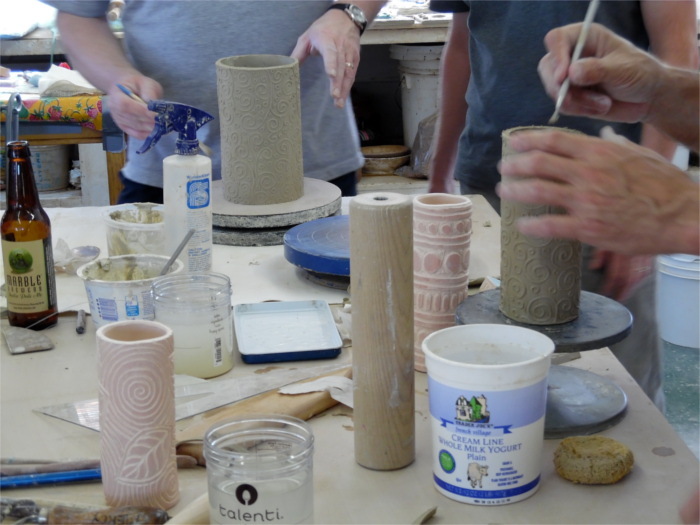 Or throw pots or hand-mold clay sculptures with Santa Fe Clay Play. Professional clay artist Ginny Zipperer will open her studio to you and help you learn and create with clay. 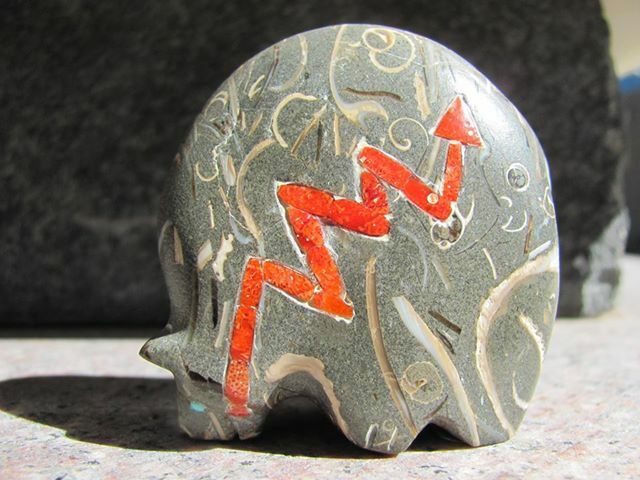 Both activities will have you taking home hand-made mementos of your creative experience in Santa Fe. A team enjoying Ginny’s Clay Play group class. Another unique art experience is to head to the only Museum of Encaustic Art in the U.S., and discover the art and beauty of wax, from ancient beeswax to the modern crayon. They offer fascinating workshops throughout the year (from February to December). They also have a schedule of free workshops for children age 7 to 17. Check the link for contact info and access to their website and schedule. Remember to mention Santa Fe Selection when you call or visit. 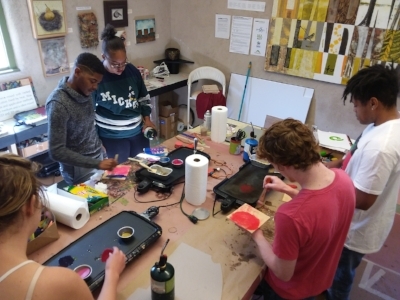 Working with wax is a lot of fun for all ages with the Museum of Encaustic Art. Kids 7-17 are free. Keep in mind, no prior experience is required for any of our recommended hands-on art classes. Simply come with a curious mind and a willingness to have lots of fun and ​make a​ mess! That should be enough to leave you feeling welcome, artistic, and acquainted, and ready for a nap before dinner. I recommend heading back to Canyon Road and to The Compound for a special dining treat. Chef Mark Kiffin is the James Beard Foundation’s “Best Chef of the Southwest.” The fountain patio, or cozy dining rooms create the right atmosphere for an excellent wine-paired dinner. 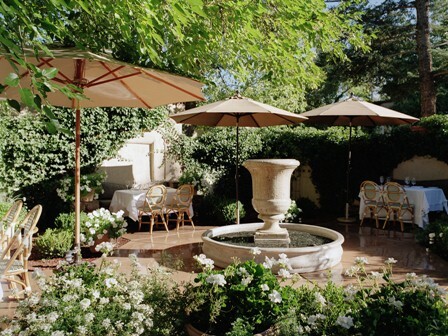 Enjoy a delicious award-winning menu inside or on the garden fountain patio at The Compound. For a more casual mom and pop atmosphere, serving authentic Norteño New Mexican fare, I recommend Casa Chimayo. Tucked in downtown Santa Fe, on West Water Street, just off Guadalupe Street, you’ll enjoy hearty dishes including the enchiladas famously featured on Food Network’s Diners, Drive-ins & Dives, fajitas, carne adovada, salads, posole and chile en nogadas and much more. 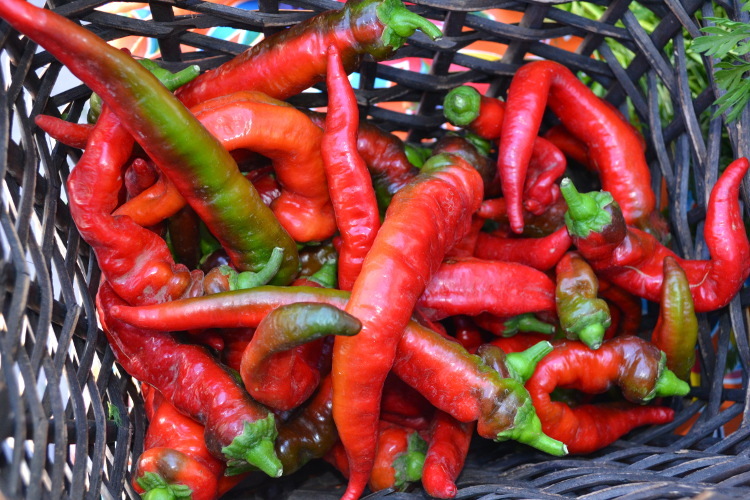 They grow their chiles in New Mexico from the original Chile de Caribe seeds first brought over by the family’s ancestors in the 1500s. Ask for the Santa Fe Selection discount and receive 10% off at Casa Chimayo! If you’re in the mood for casual with some live entertainment, then Cowgirl BBQ is a fun stop. They have a large, family-style menu, a full bar, and live music which usually begins at 8 pm (check the link for the entertainment calendar). If you’re with small kids, there’s a jungle gym conveniently situated just off the dining area. 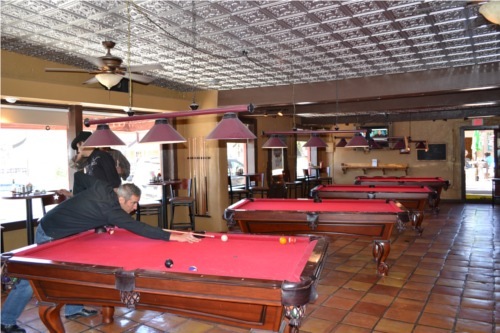 There’s also a games room with pool tables for a pre- or post-dinner game for the grown-ups. And an added treat, The Cowgirl’s full bar serves up a wide variety of margaritas. Check more recommendations in our Restaurants Category for a style that suits your cravings and budget. It’s important to explore beyond the city limits to get a real taste of the unique Norteño lifestyle and art scene. I recommend booking a day trip with Robbie O’Neill and her Cultural Treasures Tours. After breakfast, Robbie will meet you at your hotel and take you into the Spanish land-grant village of Chimayo to introduce you to some of her dear artist friends. 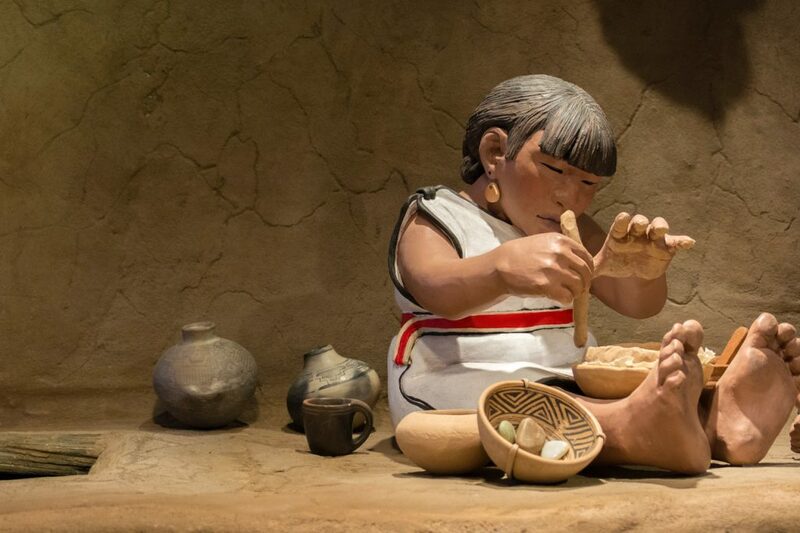 En-route you can make a stop at the Poeh Cultural Center for a free walk through the wonderful exhibit created by well-known potter Roxanne Swentzell, which tells the history and culture of the Tewa people. Poeh Cultural Center’s Nah Poeh Meng Potter – by Roxanne Swentzell. 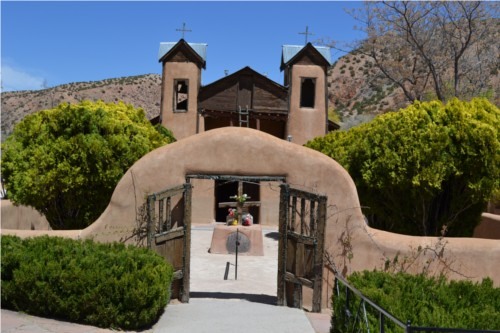 Chimayo is located on the High Road to Taos, an easy, scenic thirty-five-mile drive from Santa Fe. Many artist communities dot the High Road. If you’re here during the last two weekends of September, then you’ll have many options of galleries and studios to visit during the High Road Artists Studio Tour. But any time of year works well. Robbie will arrange a few quality stops where the artists will demonstrate their work for you. You’ll also be treated to a delicious home-cooked lunch featuring popular local dishes. You can visit the historic and legendary Chimayó Santuario, where many pilgrims have experienced miracles of healing. Also known as the “Lourdes of the Southwest,” El Santuario dates back over 200 years. The legend recalls that on Good Friday, early in the 1800s, a villager found a wooden cross buried in the earth on the site where the santuario now sits. He brought the cross to his local church, but the cross disappeared, only to be found again, buried in the same original spot at Chimayó. The villagers were in awe of this “miracle” and believed it to be a message from God that a church should be built on that spot. To this day the earth is believed to be miraculous, and many people will take small packets of earth from the sacred spot inside the church so that they may have some of the healing powers with them. Every Easter on Good Friday, pilgrimages take place. Hundreds of people trek on foot from their homes, some from as far as Albuquerque, to the sacred site. If your schedule permits, after lunch, Robbie can take you into one of the northern Native pueblos where you’ll meet more friends who are established artists in jewelry, painting, or pottery. Tour duration: Approximately 6-7 hours. Schedule and pick-up time to be arranged with Robbie.(505)231-0855. Mention Santa Fe Selection when you contact her. For dinner, I recommend a change of culture for a bit of variety. Take a quick trip to an authentic Italian farmhouse restaurant with a stop at Il Piatto Trattoria located one block from the Plaza. Award-winning Chef Matt offers a delicious Italian Farmhouse menu filled with locally-sourced ingredients, in a romantic setting, and an extensive wine cave for the perfect pairings. 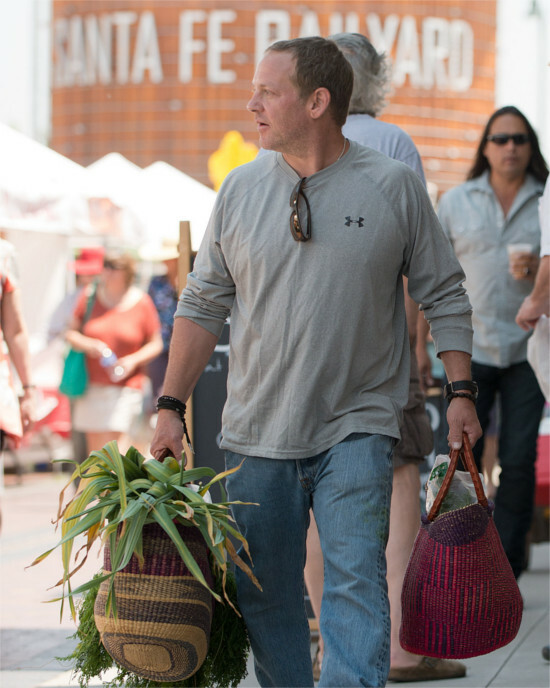 Chef Matt Yohalem of Il Piatto doing his farm-to-table shopping at the Farmer’s Market. After breakfast, unplug from all screens and phones, and take an easy stroll with the Santa Fe Selection Mini Guide Map. It’s an easy way to discover the points of interest, museums, unique shops, galleries, and restaurants in the Downtown Historic District. If you’d like to learn about the history and characters that surround you, book a Sense of Place Tour with Tom Gallegos. Tom is an excellent historian and guide. He’ll walk you from your hotel or preferred meeting place and guide you through time around downtown Santa Fe. Tour Duration: Ranges from 1 – 2 hrs. You may want to buy gifts for family and friends, or browse the variety of galleries and arts in the area. Check out our top shopping and gallery recommendations, you’ll also find many of the recommendations on our Mini Guide Map. 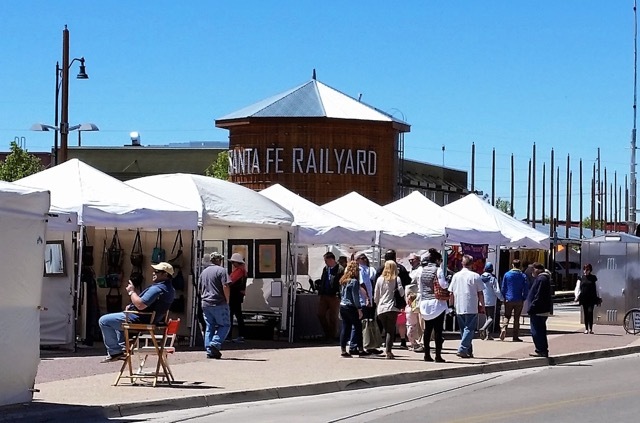 If it’s a Saturday, between March and the end of December, you’ll find some unique gifts at the Santa Fe Artist’s Market, located alongside the railroad tracks, near the Farmer’s Market. With as many as 100 juried artists, there’s a quality display of a variety of fascinating arts and crafts, including painting, ceramics, glass, leatherwork, sculpture, fashion, textiles, photography and more. Santa Fe Artists Market at The Railyard. As you head to the historic Plaza area, be sure to stop in at Keshi- The Zuni Connection, where you’ll be treated to the largest collection of authentic Native Zuni fetish artwork. All their staff are happy to share their extensive knowledge of the fascinating traditional arts and culture of the Zuni people. I do caution guests to watch out for the shops that say they offer “authentic Native works” but don’t. Our shopping recommendations are vetted, and you can be assured they do offer authentic Native works. Inlaid Zuni Bear Fetish at Keshi- The Zuni Connection. A bear (the most sacred fetish for the Zuni) represents healing, protection, strength, and mothering. Just on the other side of the plaza, on Lincoln Ave, you’ll connect with the work of iconic artists at the Allan Houser Gallery, and the Namingha family of Native artists at Niman Gallery. A multitude of well-known Native American artists are exhibited just across the street from Houser and Niman at True West Gallery. And more original Native works can be found at Faust Gallery, just around the corner on Palace Ave. 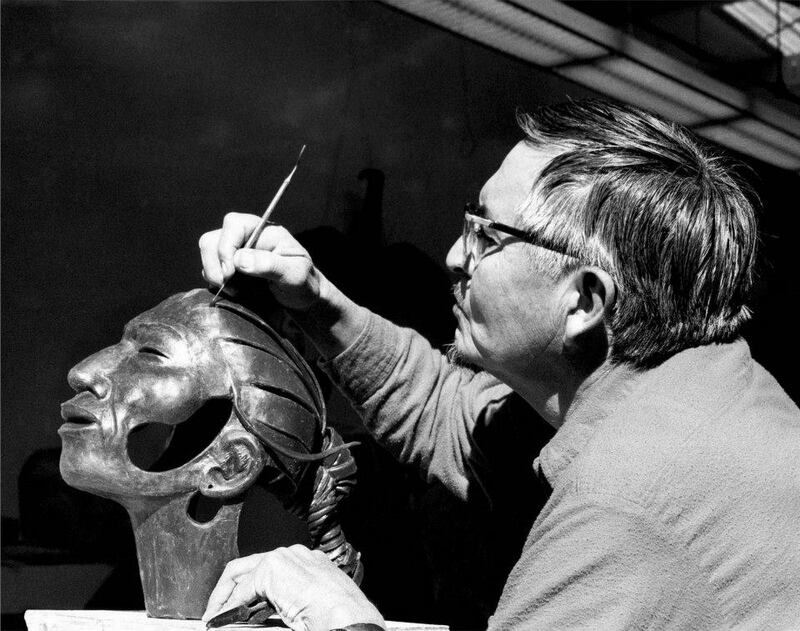 The legendary Allan Houser working on bronze. 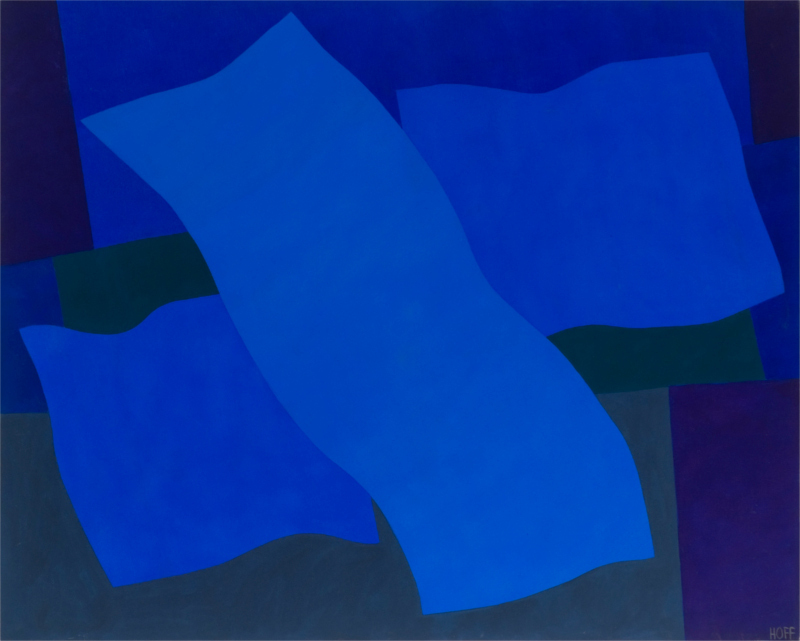 For more recommended galleries offering a variety of genres, go to our Art Galleries category. Around the plaza area, you’ll find the New Mexico Museum of Art, the Georgia O’Keeffe Museum, the New Mexico History Museum, and the famous Loretto Chapel where the miraculous staircase resides. 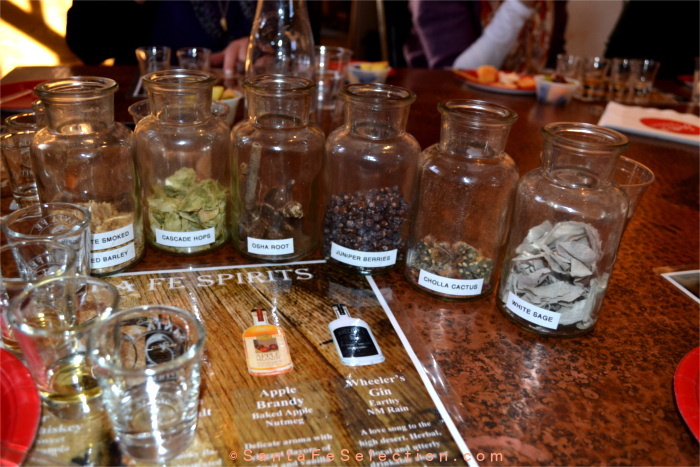 I recommend taking the “Sip and Savor” Food Tour with Wander New Mexico Food Tours. Use the promo code mentioned in this link to get $10 off your tour. This is a half-day tour and will delight your senses with a range of delicious delectables, tastings, and wine pairings from top chefs and restaurants. Or you could stop for lunch at any of the reliably yummy lunch spots, and continue your own exploration and check out a variety of New Mexico wines at The Wine Spot, or sample the unique artisanal spirits and cocktails at Santa Fe Spirits downtown tasting room, or visit their Southside distillery for a tour and tasting. Santa Fe Spirits tasting flight of artisanal spirits created with local botanicals. The distillery is located about 7 miles from downtown. If you didn’t rent a car, Uber is an option. You may want to note that it is also close to the Santa Fe regional airport. You could save it until departure day, it’s a great stop for a tasting “flight” on your way to catch your flight home. Even after an afternoon of tastings, there are always more amazing restaurant options you may not have experienced yet, such as Joseph’s Culinary Pub. A local fave, only open for dinner, Joseph’s offers delicious, creative fare from steak to fish, game and poultry, and excellent veggie dishes, by chef Joseph Wrede. On any of the nights, you may wish to follow dinner with a visit to one of the excellent performances Santa Fe has to offer. I recommend booking a concert with Santa Fe Pro Musica, or Performance Santa Fe, or Aspen Santa Fe Ballet (check the links for their calendars, and performance schedules, and to purchase tickets). Or if you’d like something more casual, check out the schedule of bands at The Cowgirl, or El Farol’s line-up of bands in their bar area. (But we’re saving the El Farol Flamenco Dinner Show as a last night treat). 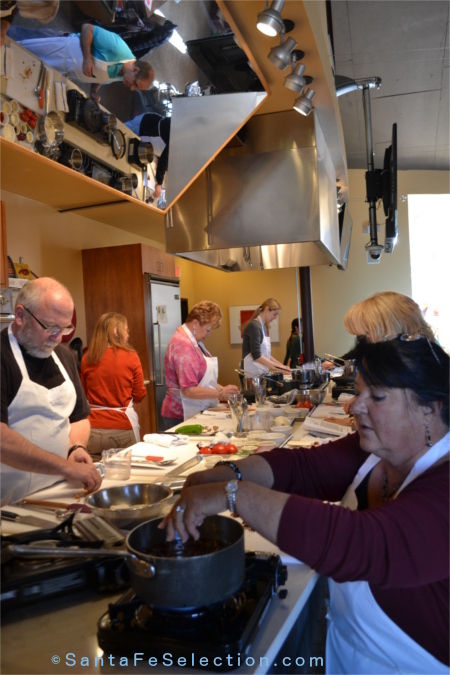 10am – 1pm /1:30pm: Hands-on Cooking Class at Santa Fe School of Cooking. After tasting delicious dishes from top chefs, you’ll want to learn something about how to take that talent home with you and impress your friends and family with authentic New Mexican recipes and techniques. Choose from a variety of classes and check the schedule to suit your needs. Hands-on classes will teach you methods for delicious chile rellenos, tamales, authentic salsas, Southwest sauces, and much more, including the intricacies of the official state veggie (chile) in many preparations. A class at work on chile prep. There are many options of demonstration classes from traditional Norteño New Mexican, where you’ll learn local techniques and regional lore, to Contemporary Southwest and Mexican cuisine. If you’re with a group, you can also book a custom class and have a lot of fun preparing and eating delectable dishes with your friends. Check this link for the complete schedule of all classes, or call directly (800) 982-4688 and mention Santa Fe Selection when you book. Duration of classes range from 2 hours – 3hours. 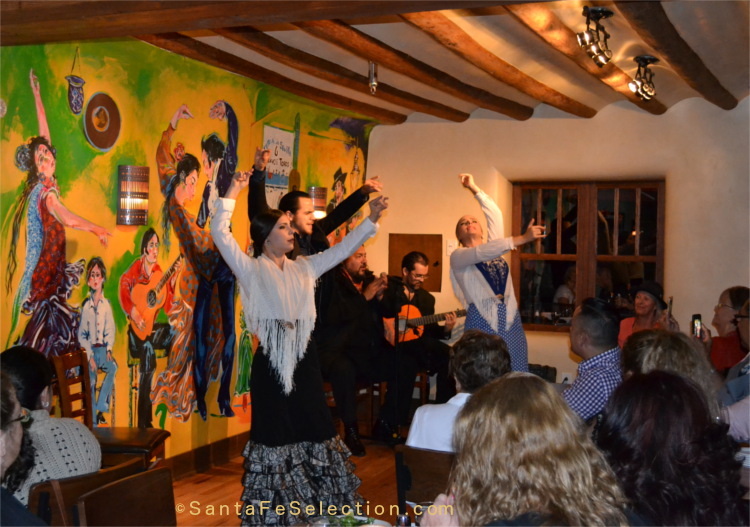 For a memorable dining and entertainment experience, I recommend you be sure to have booked a table in advance of your arrival in Santa Fe at El Farol for their Flamenco Dinner Show (they book up in advance). 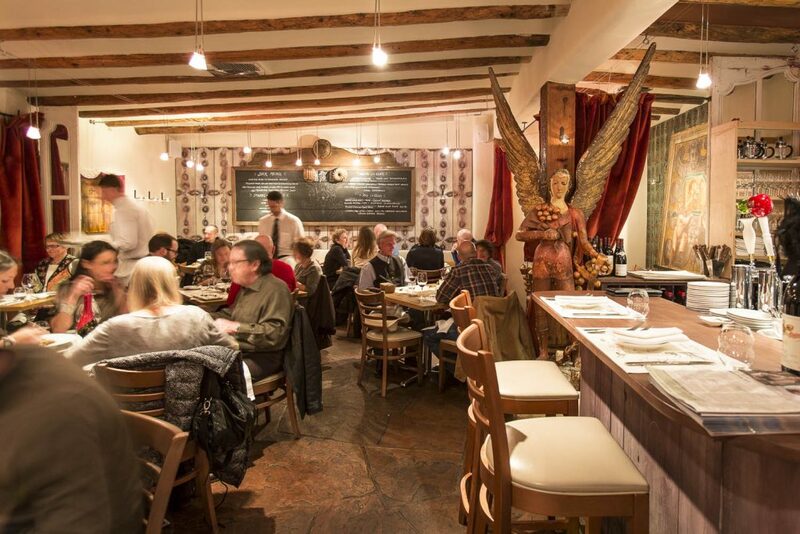 Located at the top of historic Canyon Road, you’ll enjoy a light meal of authentic Spanish tapas, or your choice of full entrees, followed by a world-class, passionate Flamenco performance in an intimate setting. If waiting until the last night isn’t convenient, you can usually book one of their dinner shows each week-night during the season. Check the El Farol calendar at this link. A passionate Flamenco performance in the intimate setting of El Farol. Since 1835, El Farol has been a local and visitor favorite for food and entertainment. The intimate, historic setting is reminiscent of the original caves of Old Spain’s Granada where food and flamenco have also been a tradition since the 1800s. You’ll arrive between 6.30 pm and at the very latest 7 pm for your dinner service, and if whether your appetite is hearty or light, don’t worry, there are plenty of light authentic tapas plates to choose from along with a full dinner menu of delicious Spanish dishes.The dinner service is followed by the Flamenco performance. Olé!! Other romantic finale dinner options I recommend are The Compound, Joseph’s Culinary Pub in the downtown Guadalupe/Railyard District about 6 blocks from the Plaza, Midtown Bistro, which is a little off the beaten path in the Midtown District, but still only 1.7 miles from the Plaza, Il Piatto Italian Farmhouse 1 block north of the Plaza, or Blue Heron with Chef Rocky Durham, which is about 20 minutes’ drive on the original historical El Camino Real. Reservations are strongly recommended at all locations. To go more casual, or for a style that suits your cravings and budget, relax at any one of the popular favorites on our list of top restaurants. If you’re with very young children, I recommend keeping it casual at La Choza, Del Charro, The Famous Plaza Cafe, Casa Chimayo, Santa Fe Bar & Grill, or Cowgirl. Departure Day: If your flight doesn’t leave Albuquerque or Santa Fe airport until evening, you’ll have time to enjoy a brunch or lunch before you go. Midtown Bistro offers delicious lunch and weekend brunch. It’s close to downtown but lesser known by visitors, located in the Midtown Innovation District, only 1.7 miles from the historic plaza. It’s a local fave for daily lunch and dinner and weekend brunch. Or you could stop in early at Meow Wolf for an exploration of their famous interactive art installation, followed by a delicious and invigorating Food of the Gods workshop, elixir tasting, truffle making class, or coffee workshop at International Chocolate Award-Winners Art of Chocolate – Cacao Santa Fe. (not to be confused with Kakawa Chocolate). Cacao-Art of Chocolate is the only bean to bar chocolate factory and café in Santa Fe. 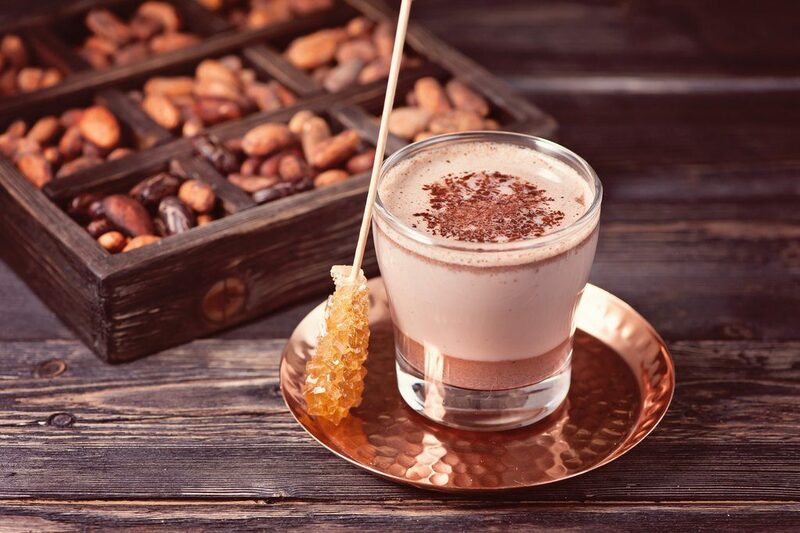 Experts in the history and cultivation of chocolate, they grow their own beans in Hawaii and Belize and handcraft delicious truffles, bars, coffees, and authentic elixirs. Cacao is located only a few blocks from Meow Wolf, in the Midtown Innovation District, at the corner of Parkway and Richards Lane. Check the link for their calendar of tours/classes, or use the Santa Fe Selection Mini Guide Map to find them and stop by the café for a scrumptious chocolate truffle, coffee, elixir, and pastry. Cacao-Art of Chocolate Elixir Tastings, Workshops, Factory Tours are a fascinating way to experience truly organic, healthy chocolate in many forms. That’s just a starter for ideas for your art and food lovers five days in Santa Fe. There are many more ideas at SantaFeSelection.com. I’m pretty certain you’ll want to come back again to experience more of this unique and flavorful destination. For your free Mini Guide Map, more information and specific recommendations and referrals, OR to sign up to receive my monthly blog articles in your inbox, send me a note at Maria@santafeselection.com or call 505-470-2991. PLEASE REMEMBER TO MENTION SANTA FE SELECTION WHEN YOU CALL OR BOOK ANY OF YOUR TOURS OR RESERVATIONS, THANK YOU!! Enjoy your visit to Santa Fe! !